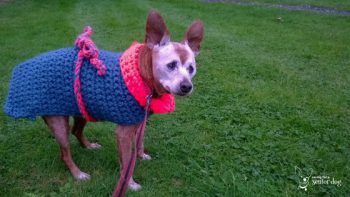 I see so many lists for new puppy items, but not so many for senior dog supplies!! What’s up with that…senior dogs also need stuff!! 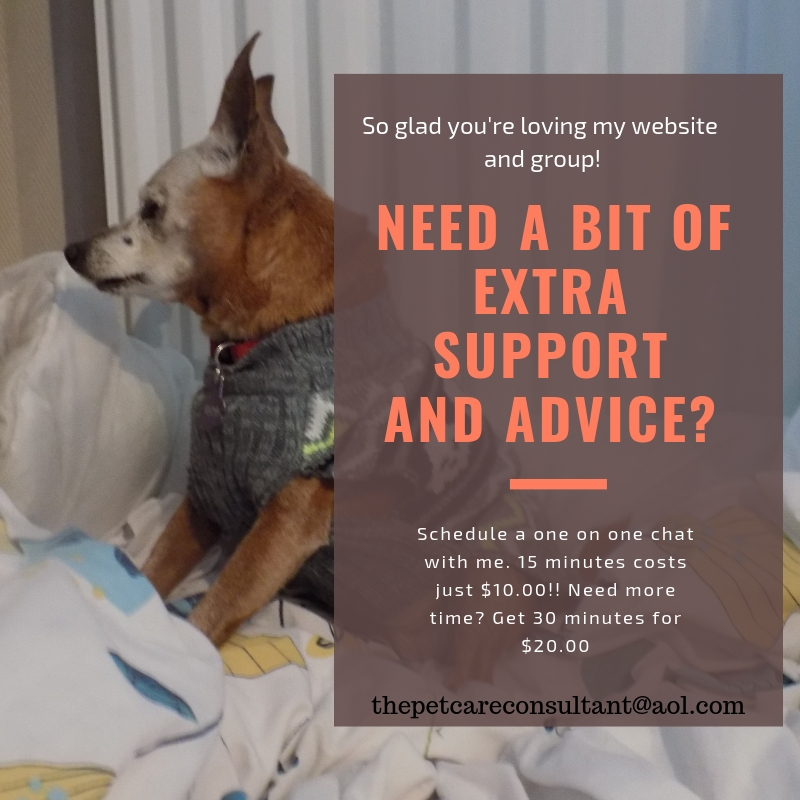 If you’ve shared your life with your dog since he was a puppy, I’m sure there’s no shortage of supplies, but have you adapted them to his changing needs? If you’ve just adopted an old dog, congratulations you’re amazing by the way, then you’re definitely going to need to do some shopping. I put together this list based on my experience living with seniors, and figuring out ways to keep them as comfortable as possible. Oh did I forget to mention active as well? This list is as extensive as possible, but don’t worry…it doesn’t mean you have to get everything!! 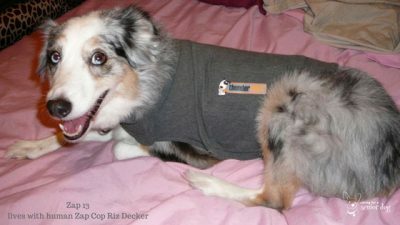 Older dogs may feel the cold more than their younger counterparts, so having outerwear handy is a good idea. As Red got older and we moved to a colder climate, she wore a sweater indoors and out a good part of the year. Whether yours will need one will depend a lot on the temperature and how much hair he has!! Warming mats: self-heating or electric – Another way to keep your pup warm on a cool night is to have a warming pad on the bed. Available in a self-heating style or plug in, the choice is up to you but do be careful of cords. Call me paranoid but I prefer self-heating, and I used to keep one on Red’s bed all year round. Orthopedic bed – If your dog is experiencing joint pain, an orthopedic bed may provide the comfort he’s looking for. Some also come with magnets, which you may have heard are used to help relieve pain in human arthritis sufferers. Bed with raised sides and low front – Another style your dog may like is one that has 3 sides raised so he can lean against them like a pillow, and an open front to walk right onto the bed. No leg lifting needed!! A big comforter – Another option for a relaxation spot is a single or double comforter. I don’t know about you but my senior dog always liked variety so if she wasn’t in the mood for one style, there was always another to try. This turned out to be her favourite the last few years because it was so poufy, yet flexible enough for her to shape into the style she wanted. 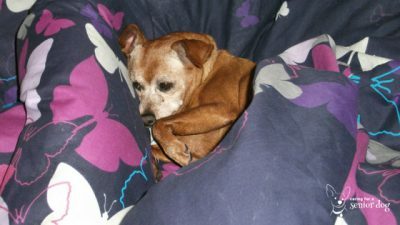 Fleece blankets – comfy and cosy, I never have too many! When one or two were in the laundry I always had another I could grab. I kept one on every bed in the cooler months, and they were perfect for cuddles on the couch. Waterproof dog bed cover – if your dog has accidents, a waterproof cover may cut down on the number of times you have to wash the bed, and it’s certainly easier to wash.
Raised food and water bowls – I found as Red got older I wanted to raise her water bowl so she could get to it a lot more easily, and I do believe it made her more comfortable. I did the same with her food bowl but I held it for her so she could find the food more easily. She was blind, and it was particularly helpful when she wasn’t as interested in eating as she had been. Cooling mat/bandana/shirt/jacket for the hot weather – This is a must if you live in a hot climate. I have the bandana for Jack who doesn’t do well in the heat and it makes a big difference. My neighbour bought a cooling jacket for her senior Shepherd and she couldn’t get over the incredible results. She was able to go back to taking her walks in the warmer weather. Nanny cam – A nanny cam is a great tool for keeping an eye on your senior dog when you’re out. Perfect if you’re curious about what he gets up to, or he’s not well and you want to check up on him. Pee pads – I always say I wish I had bought stock in the company, I could not live without this product. Whether I line the carriers with them when travelling, or cover my entire floor, they are a “must have” if your dog is having accidents. They are available as disposable or washable. Doggie diapers – A very popular item for dogs with incontinence, diapers come in disposable or washable versions. Many pup parents put a sanitary pad in for better results. Carpet stain and odour remover – A necessity for cleaning up accidents, and believe me they somehow find a way to pee in between the pee pads!! As with any product, not all are created equal so you may have to try more than one to find what works best for your carpet. If you prefer natural products there are plenty on the market, or you can make your own. Ramps and pet steps – They serve the same purpose as a mobility aid, but the one you choose will depend on the need. For help getting into the car, a ramp is typically what you want, just check the incline isn’t too steep and be sure it’s foldable for easy storage in your vehicle. Steps are most often used for getting onto the couch for example, as a ramp would take up a lot more floor space and be too steep. 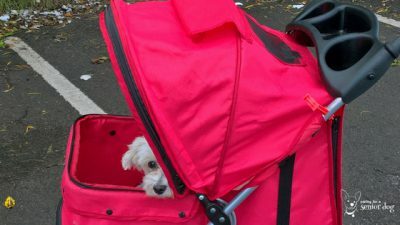 Dog stroller – My all time favourite invention, and a product I can’t say enough great things about…so rather than repeating myself I will let my previous articles do the talking. Non slip socks/booties – If your dog is having mobility issues, is less steady on his feet and seems to be slipping on your hardwood or tile floors, non-slip socks or booties may be the answer. Carpet squares or yoga mats – If your dog won’t let you near him with a pair of booties, as mine never did, a perfect solution is covering your slippery floor with some carpet squares or yoga mats. Wheelchair – Whether your dog has lost the use of his legs, or is having trouble standing and walking on his own, a wheelchair can drastically improve your dog’s quality of life. 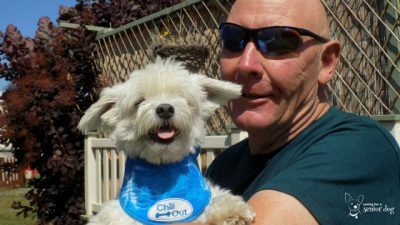 Sling or harness – An option in many mobility cases, I used one when my dog was recovering from spinal surgery due to paralysis. I couldn’t have taken him for walks without one! Toe grips – Another mobility aid in your arsenal, made of rubber they slide over your dog’s nails and add traction on slippery surfaces. 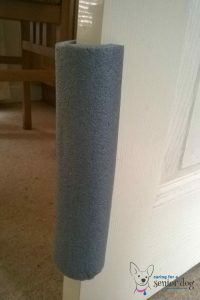 Foam padding for table and chair legs/doors – If you have a blind dog, or one suffering from dementia who’s confused and bumps into things, some foam padding is perfect for table and chair legs. As you can see in the picture, I put them at head height on the door as well. You can likely find the foam at a DIY store or maybe even cut a pool noodle lengthwise and use that. Adjustable pen – If you worry about your dog’s safety when you’re out, an adjustable pen will give him some space to roam, but limits it. They come in various sizes so you can create as big or small a space as you like. 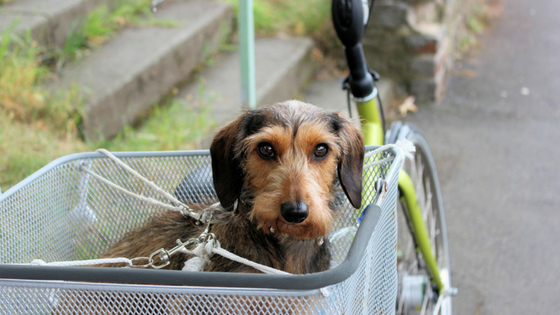 Bike basket or trailer – There were many times when I would take my senior dog Red with me on my bike, and she would sit so nicely in my basket. I’ve also seen many other cyclists who have a trailer for their dogs and they’ve loved it! 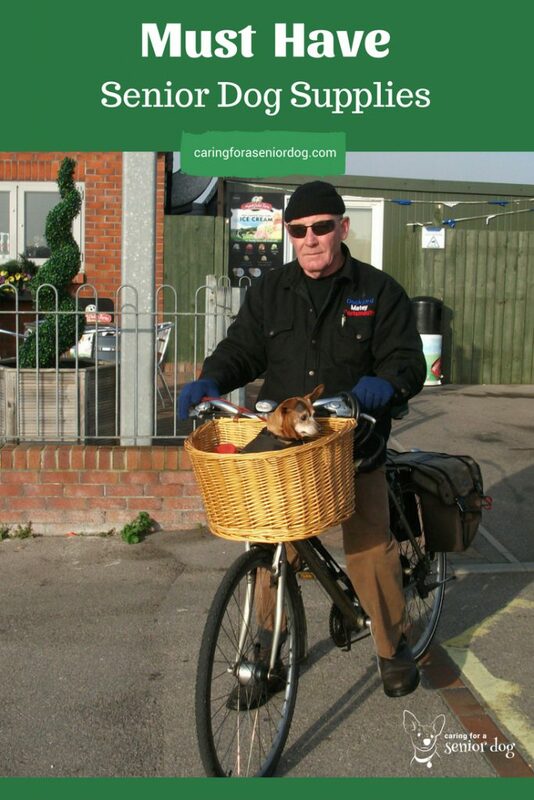 What a great way to do something you love, and include your older dogs too!! List of foods for when your dog won’t eat – It’s not uncommon for there to be some challenges getting a senior dog to eat when they’re not feeling well, or suffering from health issues. I know from my own experience how frustrating and worrying it can be. Do yourself a favour and have a list of possible foods that are safe for your dog, in the event he loses interest in his current diet. It will save you a lot of last minute scrambling. For my dog’s condition I know that boiled chicken, rice, Skyr, white fish such as cod and no fat cottage cheese were some of the options. Mobility – In addition (or instead of in some cases) to the medications your vet may have prescribed for your dog’s joint pain, natural supplements such as glucosamine, chondroitin, New Zealand Green Lipped Mussels and turmeric golden paste are known to be extremely helpful. Sling or harness for extra support – I mentioned this in the mobility section but it’s worth mentioning again. If your dog is having trouble walking, please don’t just leave him on his bed to sleep his life away. In addition to any pain medication, supplements or physical therapy you may be doing, having a sling or harness will give him extra support so he can get out there and get some exercise which, believe it or not, does help joint pain. Create a bit of an agility course even if you don’t have much room. A broom can be slightly elevated so he has to lift his leg to walk over it – a couple of pillows spaced widely on the floor he has to walk around. Snuffle mat – Perfect to keep dogs entertained and a chance to expend some energy and even challenge them mentally. Typically made of rubber with a lot of fleece strips attached, treats are hidden amongst the strips and your dog then has to find them. Puzzle or treat dispensing toy – Another great tool for mental stimulation, find a toy that’s challenging so he has to figure out how to get the tasty treat inside. Too hard and he’ll lose interest, but many can be adjusted to various degrees of difficulty. Shampoo and grooming wipes – There are plenty of reasons why your dog may not enjoy the groomer as much as he used to, or finds it difficult to stand for any length of time. Giving him a bath at home means shorter visits!! Grooming wipes are also handy for a quick clean. Brush – Brushing your dog is a wonderful opportunity to bond and just hang out together…and most dogs love it!! Some senior dogs develop lumps, bumps and growths so a soft bristled brush may be best. Dental care – Brushing our dogs’ teeth is as important as brushing our own and there are a lot of products to help. Toothbrush – There are many styles of toothbrush including long handled, electric and one to fit on your finger. Toothpaste – Toothpaste comes in a variety of flavours and textures, you’re bound to find one your dog likes. Dental wipes – If your dog won’t let you near him with a brush, perhaps a wipe will be acceptable? 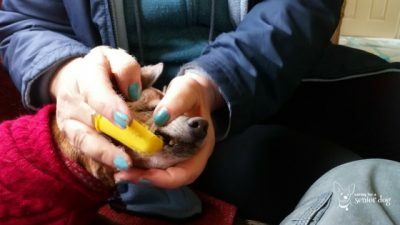 Dental chews – If you can’t get near your dog’s mouth to brush his teeth, how about a dental chew? Water additive – Whether all else fails and it’s your only option, or another dental care tool, pour some in your dog’s water and he will get some benefit. You may be wondering what’s so special about this list, you have almost everything on it!! A senior dog is still a dog, and the majority of the supplies you have for a puppy will be the same for a senior, with a few differences. Having said that, a first time dog parent, or someone who has never raised a senior dog before will find this list very handy. Tell me, do you have anything for your senior dog that’s not on this list? Sharing helps others so please leave a comment below or come chat on my Facebook page. This is a brilliant list and as someone who has recently lost a senior dog it’s a lovely reassurance that I did a good job of caring for her as I can tick off most of the items. Thanks for sharing Hindy. I’m sure you did a great job caring fro your senior dog, no list can change that!! I live in central/North Jersey. Does anyone need some supplies for their senior dog (cranberry and joint chews, incontinence meds, etc.). I lost my very best four legged friend and had just ordered her all new supplies, I want to pass them along to someone who is in need/struggling financially. Thank you Nancy that is very kind. I will pass that along in my FB group and let you know.